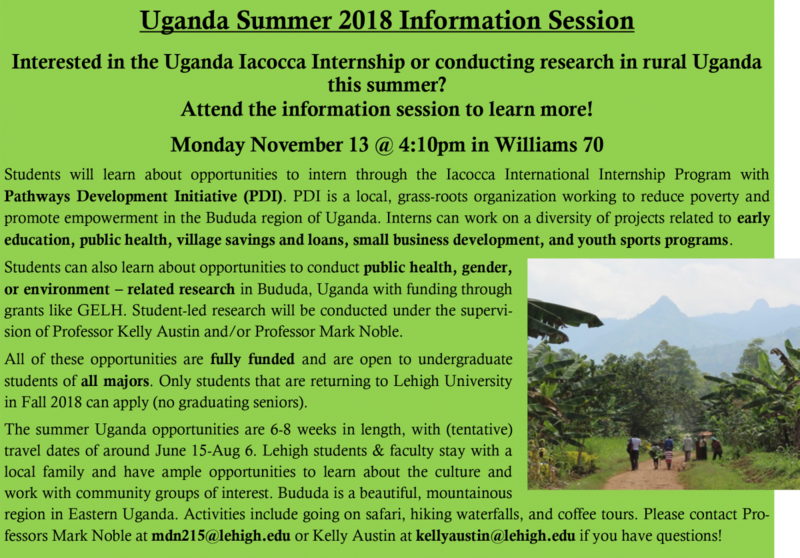 Interested in interning or conducting research in rural Uganda this summer? Attend the information session to learn more! promote empowerment in the Bududa region of Uganda. Interns can work on a diversity of projects related to early education, public health, village savings and loans, small business development, and youth sports programs. Students can also learn about opportunities to conduct public health, gender, or environmental – related research in Bududa, Uganda with funding through grants like GELH or Strohl. Student-led research will be conducted under the supervision of Professor Kelly Austin and/or Professor Mark Noble. All of these opportunities are fully funded and are open to undergraduate students of all majors. Only students that are returning to Lehigh University in Fall 2017 can apply (no graduating seniors). work with community groups of interest. Bududa is a beautiful, mountainous region in Eastern Uganda. Activities include going on safari, hiking waterfalls, and coffee tours. Please contact Professor Kelly Austin at kellyaustin@lehigh.edu if you have questions!